Home / Uncategorized / Can’t Live Without ……. 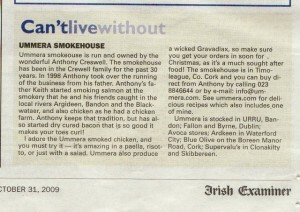 Ummera Smokehouse is run and owned by the wonderful Anthony Creswell. The smokehouse has been in the Creswell family for the past 30 years. In 1988 Anthony took over the running of the business from his father. Anthony’s father, Keith, started smoking salmon at the smokery that he and his friends caught in the local rivers Argideen, Bandon and the Blackwater, and also chicken as he had a chicken farm. Anthony keeps the tradition, but has also started dry cured bacon that is so good it makes your toes curl! I adore the Ummera smoked chicken, and you must try it – it’s amazing in a paella, risotto or just with a salad. Ummera also produce a wicked Gravadlax, so make sure you get your orders in soon for Christmas, as its a much sought after food! The smokehouse is in Timoleague, Co. Cork and you can buy direct from Anthony by calling 023 8846644 or by e-mail info@ummera.com. See ummera.com for delicious recipes which also includes one of mine for a West Cork Paella!. Next post: Our favourite Organic Porridge wins…..